The casualties of this struggle are first and foremost Bulgaria’s Muslim believers. But another potential casualty is the peaceful co-existence between them and the country’s Orthodox Christian majority, which is becoming increasingly alarmed by a series of inflammatory reports in the country’s media. The conflict appears to have been sparked by the introduction nearly two years ago of legislation, the Religions Act, requiring the country’s religious groups and leaders to register or re-register with the authorities. At that time, two separate factions within the Muslim minority put forward rival candidates for the post of chief mufti, the head of the community. However, due to the similarities between the two men’s applications and confusion over a previous legal challenge to the leadership, the courts are still debating the issue. As both candidates waited for the courts to decide who will lead the community, their followers began to accuse each other of “brainwashing” young people with Islamic fundamentalism; having links with extremist groups; and even preparing for a religious war in the country. Many observers dismissed these accusations as being part of a crude propaganda war waged by rival factions eager to gain control of the substantial property and wealth acquired by the Muslim leadership down the centuries. Hristo Matanov, an historian at Sofia’s University St. Kliment Ohridski and former head of the state religious directorate, told IWPR that the battle for the leadership was especially bitter because so much is at stake. “I believe this is a struggle over property and for control over the financial support coming from [abroad],” he said. The Bulgarian Muslim Nomination – the community’s administrative body – owns a large variety of residential, office and commercial buildings, agricultural land and city plots, donated by members of the community over the years. These are located in what are now the most prestigious and high-priced areas of several cities and towns, and are rented out to private tenants and commercial enterprises, resulting in a sizeable income for the Muslim hierarchy. In the wake of the September 11 attacks on the United States and the subsequent wave of bombings linked to Islamic militants worldwide, the Bulgarian media seized on the allegations of fundamentalism and the perceived threat from extremists, sparking an often-panicked debate on the degree of Islamic influence in the country. The influential weekly Kapital, for example, recently published its own investigation into radical Islamism inside Bulgaria, alleging contacts between the office of the chief mufti and various Arabic organisations, and highlighting what it describes as a lack of transparency in the management of Muslim schools and institutions. But some other less considered articles in the tabloid press – many of which allege that Islamic militants are at large in the country and encouraging young men to become involved with Jihad or Holy War – have alarmed the population at large, causing increased tension and suspicion of the Muslim community, and threatening to end centuries of peaceful co-existence. Bulgaria’s Muslim community is one million-strong and comprises just over 12 per cent of the 7.9 million population, according to the 2001 census. Most are ethnic Turks descended from settlers who came to Bulgaria during the 500-odd years it formed part of the Ottoman Empire. The next largest group is the Roma, who number around 371,000. Then there’s the Pomaks – ethnic Slavs who converted to Islam during the Ottoman era but who continued to speak Bulgarian. Their number is unclear as while official figures suggest that only 70,000 live in the country, unofficial estimates indicate that the real number could be as high as 175,000. All three communities are Sunni Muslim. The Muslim community’s strong connections with Turkey brought a number of difficulties after Bulgaria threw off the Ottoman yoke in the 1870s and became an independent and mostly Christian state. Subsequent efforts to expel or assimilate Muslims resulted in a drop in their numbers, from 30 per cent of the total population in 1881 to fewer than ten per cent by 1934. State oppression continued when pre-Soviet communists took over Bulgaria after the Second World War. In spite of the new regime’s proclaimed commitment to equality, it soon instigated three waves of sponsored emigration of ethnic Turks – the last of which took place in the late Eighties, only months before the fall of the Berlin Wall triggered the collapse of Eastern European communism. More than 350,000 Turks left Bulgaria in the summer of 1989, of whom about 100,000 later returned. Bulgaria’s transition to democracy brought a new approach to the Muslim minority. The community was allowed to reinstate the Islamic names lost when the communist regime forced individuals to adopt “Bulgarian” surnames in the Eighties, and those who had been jailed on ethnic or political grounds were released. Property was handed back to those who returned after the fall of communism, or compensation was offered in lieu. Today, Bulgaria boasts around 1,150 mosques and prayer houses – 150 of which have been built since 1989. There are three Muslim schools offering primary and secondary education in Shumen, Ruse and Momchilgrad, and the capital Sofia has an Islamic higher education institute. The advent of multi-party democracy also offered Muslims an opportunity to participate in the decision-making process. The Movement For Rights and Freedoms, DPS, was soon formed and now represents the interests of ethnic Turks in parliament. The Roma population is represented by the Evro Roma party, although this failed to gain any seats in the latest election. At present, the Pomak minority does not have separate party-political representation. The crisis in the leadership of Bulgarian Muslims – which had been brewing ever since the Religions Act was passed in December 2002 – peaked this summer after the courts failed to register a new chief mufti under the provisions of the legislation. A court ruling was, in fact, almost impossible, as the two contenders for the post had submitted near-identical documents, each certifying that they had been elected by their community, as the law requires. One candidate, Fikri Sali, is widely supported by the DPS. The other, Ali Hadzhi Saduk, is closely connected to the former chief mufti Nedim Gendzhev. Gendzhev held the top job until 1997, when the National Muslim Conference – the body charged with the appointing the chief mufti – replaced him with Mustafa Hadzhi, who was in turn succeeded by Hadzhi Mehmed in 2000. Gendzhev and his supporters – including Hadzhi Saduk – successfully contested the conference’s decision in court, and the leadership of the chief mufti office from 1997-2003 was declared illegal. The court has refused to reinstate Gendzhev who, lacking the politicial backing that might have helped his cause, now has to make do with promoting his ally Hadzhi Saduk over Sali in the race to lead the Muslim community. While awaiting a final court ruling on the current leadership dispute – which could take as long as a year to be delivered – the Sofia City Court installed a “triumvirate” to run the chief mufti’s office in the interim. However, this arrangement strongly favoured Sali, as he was appointed to the temporary leadership alongside two of his close allies. As a result, Hadzhi Saduk was left out in the cold and Gendzhev has been forced to turn elsewhere to rally opinion to his side. campaign against Sali, accusing his camp of maintaining connections to an Eindhoven-based Islamic organisation known as the Al-Waqf al Islami foundation. They claim that the foundation, which has been officially registered in Bulgaria for a decade, is linked to the al-Qaeda network blamed by western governments for extremist attacks around the world. This has been flatly denied by Al-Waqf itself. The Gendzhev faction also claims that their rivals have set up a network of camps in which young Bulgarian Muslims were being “indoctrinated with fundamentalism”. Three months ago, Gendzhev follower Nedzhip Daud was quoted by the BGNES news agency as claiming that children who graduated from “fundamentalist nests” were being sent to study in Arab countries after signing pledges to take part in Jihad. Daud later told IWPR he had seen a number of “Holy War” declarations in the possession of Bulgarian boys from the southern Rodopi area. These, he added, “promise Heaven to those who kill in the name of Allah. It is a sort of … brainwashing instrument”. Gendzhev himself has also joined the chorus of accusations, telling IWPR that he feared the crisis inside the minority’s leadership was playing into the hands of radical Islamists who were trying to seize control of the community. “This religion is being divided and non-traditional elements are gaining command of various regions,” he said, predicting that within around a decade Bulgaria would face a serious problem with the Islamic underground. “I have information that organisations banned in Syria, Egypt or Saudi Arabia [already] have their representatives in Bulgaria,” he added. Last month, Gendzhev sent a letter to the Bulgarian chief prosecutor and the United States ambassador James Pardew, blaming Sali for maintaining contacts with the Al-Waqf al-Islami foundation, and again accusing that body of links to al-Qaeda. This information triggered a nationwide debate, with Kapital publishing documents which seemed to establish a link between Sali – and others within the chief mufti’s office and the DPS – and the Al-Waqf al Islami organisation, which provides funding for new mosques and Muslim schools. It quoted a recent Dutch report which alleged that the foundation was spreading salafism-wahhabism – a puritan form of Islam which sees its role as cleansing the religion of what it perceives to be superstitions, deviances, heresies and idolatries – in mosques across the Netherlands, and of making indirect calls for a Holy War. The foundation came to the attention of the international community after news broke that six members of the group who carried out the September 11 attacks on the United States had taken part in Al-Waqf seminars in the Netherlands. However, the foundation has not been placed on America’s blacklist of “terrorist” groups and is not considered to be a danger in the Netherlands or elsewhere. In spite of this, certain sections of the Bulgarian media appear to have decided that it does indeed pose a fundamentalist threat, even though there is no real evidence to support this stance. An Al-Waqf representative in Eindoven told IWPR that the foundation had been registered in the Netherlands since 1989 and had never been accused of religious extremism by the Dutch authorities. In any case, Sali has denied that he or any of his staff had been in touch with the organisation, saying, “There is no existing partnership or contact of any kind between us or the chief mufti office and Al-Waqf al-Islami in the Netherlands.” He’s also flatly denied all allegations made by Gendzhev and his followers. Gendzhev’s concerns for the state of Islam within Bulgaria may well be reasonable, but analysts believe that his continued claims that Sali is feeding fundamentalist activity is not. The former chief mufti’s network of supporters, who have also made some very colourful claims against Sali and his group, have been viewed with some scepticism too. One of the more active and outspoken Gendzhev supporters is Ashim Hadzhiasan, who leads a group called The Straight Path for Bulgarian Nationals of Turkish Origin Foundation. A regular star of the Bulgarian media, Hadzhiasan has made several sensational disclosures in the press, including a claim to have met Osama bin Laden in Sudan in 1994. IWPR met with Hadhziasan in the Bulgarian town of Plovdiv. He told us that he had taken part in the setting-up of Muslim “combat squads” in Bulgaria, although the police deny that any such groups exist. “Those squads were created with the assistance of Fikri Sali in the Bulgarian towns of Samokov, Pazardzhik, Yambol, Kurdzhali,” he went on, adding that he had withdrawn from the groups soon after joining. Hadzhiasan also claimed that al-Qaeda was active in Bulgaria in such fields as importing goods and people-trafficking. As he spoke, a number of people arrived to join the conversation quite uninvited – all bearing reports of radical Islamic activity in Bulgaria. One man, who introduced himself only as Hussein and freely admitted that he was part of the Gendzhev faction, claimed that he had been recruited by Islamic radicals to fight as a mercenary alongside ethnic Albanian rebels during the 1999 conflict in Kosovo. “There are no jobs in Bulgaria and they promised to wire money to my parents if I fought for them,” Hussein said. “Ten or twelve of us travelled there by bus, pretending to be salesmen on our way to markets in [the Serbian cities of] Belgrade or Nis. However, Hussein was unable to provide any specific details of where they fought, who “they” were, or even what language the disparate nationalities had used to communicate in while training and in combat. He did not wish to remember the details, he said. Another speaker, who gave his name as Palamoudov, was keen to speak of the “suspicious-looking Afghans, Kurds and Arabs with beards” he had seen hiding in Plovdiv’s mainly-Roma district of Stolipinovo. However, intelligence sources in Bulgaria give such reports little credence, noting that the claims of such witnesses have been investigated repeatedly and were found to be unsubstantiated. And while Hadzhiasan promised IWPR that he could back the allegations up with documentary evidence, he has yet to do so. In spite of the hazy nature of his claims, Hadzhiasan is regularly given a platform by the Bulgarian tabloids. Such alarmist media coverage and a lack of information about Islamic centres in Bulgaria have combined to fuel suspicion and fear among the population at large. Drawing on such media reports, many Bulgarians now claim to have seen “bearded silhouettes” skulking behind the walls of Muslim schools, not to mention fully-fledged “terrorists” in their midst. The private Islamic academy in the ethnically mixed village of Ustina is reportedly one of Daud’s alleged “nests of fundamentalism”. It has been in existence since 2002, but has no official status as a school and thus is not accountable to the education ministry. ed by charity foundations and the Turkish religion ministry. But Ustina’s Christian minority does not know exactly what is going on behind the thick walls of the academy. They can only hear the voice of the hodja, or clergyman, summoning people to prayer. Sometimes they see the pupils, mostly unfamiliar boys aged 15- to 20-years-old, drinking coffee on the square. What they do know is that tuition for the two-year course is free, and that discipline is meticulous. The rest remains a mystery. But Mustafa, a teenage student from Ustina itself, rejected any talk of the school being a hotbed of radicalism. He told IWPR that there was nothing sinister about its curriculum – the students, he said, learn Arabic, read the Koran, memorise prayers, learn to bow, to sing and perform religious rituals. During their breaks, he and his classmates talk about “all sorts of things” from cars and bicycles to sport and even girls. 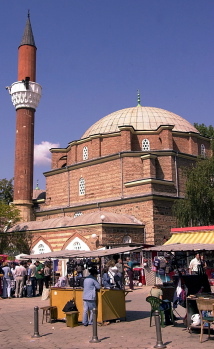 The recent crisis has shown that Bulgarian Muslims may be in contact with foreign organisations which are more conservative than the majority of local believers are familiar with, but this does not necessarily mean that the wahhabi faith or other fundamentalist denominations are spreading in the country, analysts insist. Nor does it mean that recent claims about an established, growing extremist network are reasonable, they say. Gendzhev insists that hardline newcomers with ways alien to Bulgarian Muslim traditions are dividing the community. He holds that wahhabi beliefs are being preached and that young people are being brainwashed in academies for imams supported by his rival. Sali holds the exact opposite view. He insists that there is no serious division in the Bulgarian Muslim community – only a degree of political manipulation. “One consequence of recent world events [such as terrorist attacks] is that Bulgaria’s Muslims have grown more responsible, and if anything are less vulnerable to any fundamentalist influence,” he told IWPR. Georgi Krustev of the state religions directorate holds a “third way” position, suggesting wahhabi views may well be spreading in Bulgaria, but cautioning against the idea that this belief system is somehow equivalent to terrorism. The Bulgarian intelligence services have repeatedly declared they are not aware of any threat from domestic Islamic radicalism. “We do not have any information that any persons reside in Bulgaria who might commit a terrorist act,” Interior Minister Georgi Petkanov said on August 23. However, the Bulgarian media continue to report the alleged existence of these militants, quoting “anonymous sources” in the secret services. On July 26, for example, the newspaper 24 Chasa claimed it knew of around a dozen Bulgarian citizens who maintained close ties to the al-Qaeda network. Meanwhile, the private television station bTV claimed that the Arab community was becoming more active in Bulgaria and that emissaries of radical Muslim organisations had been spotted in the country. However, he admits that there could be a risk in the future. “Some [people] are growing financially dependant on Arab benefactors and may feel obliged to help [them]. This way, they may end up unconsciously assisting potential terrorists,” he said. In addition, Yuliana Metodieva of the Bulgarian Helsinki Committee – who has had extensive and prolonged contact with the Muslim community – is convinced that it is not likely to abandon its tradition of holding moderate religious views. The Bulgarian Helsinki Committee’s 2002 report noted that “the label ‘Islamic fundamentalism’ has been attached to a wide range of Muslim beliefs and practices… having nothing in common with any fundamentalism and broadly disseminated by the media, which has resulted in strong anti-Muslim prejudices in Bulgaria”. Metodieva, who has been monitoring the Bulgarian media since 1999, told IWPR that pejorative reporting was not a recent phenomenon, but rather has been notable throughout the past five years. She added that “manipulative writing” on the subject, which inevitably promotes xenophobia, is a permanent trend bucked only by the Kapital and Dnevnik newspapers, both of whom have tried to offer objective coverage on Islamic issues with varying degrees of success. Unfortunately, analysts fear that the situation may not improve in the near future. They believe that this internal power struggle – and the irresponsible way sections of the media are covering it – could end up being very damaging. In the worst-case scenario, the warn, it might even destroy the traditional peaceful coexistence between Bulgaria’s Christian majority and its largest national and religious minority.